The physics and astronomy major will conduct research on theoretical astrophysics in Germany. 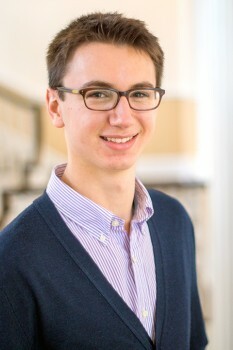 Lee Rosenthal '15 plans to spend his summer post graduation gazing at the stars. But this is no lazy, dreamy break. The recipient of a 2015-16 Fulbright U.S. Student Award to Germany plans to conduct research in theoretical astrophysics. The physics and astronomy double major with a minor in philosophy will work at the Heidelberg Institute for Theoretical Studies (HITS) with Volker Springel, who leads the theoretical astrophysics group there and also is a professor of astronomy at Heidelberg University. â€œI plan to use computational simulations to study how galaxies form and evolve,” says Rosenthal, 21, of Westfield, N.J. He also wants to engage with the astronomy-loving public through outreach. The Fulbright is an ideal way to spend a year with an international research group doing cutting-edge research, says Rosenthal, who also is pursuing graduate studies in astrophysics at the California Institute of Technology when he returns.“I hope to both expand my knowledge and activity in the study of astrophysics and grow personally by exploring a country and culture that is new to me,” he says.